Make an architectural model. Build a model of a house to a scale of 1/4"=1'0" (50:1 metric). Discuss with your counselor the materials you intend to use, the amount of detail required, outside treatment (finish, shrubbery, walks, etc.) and color selections. After completing the model, present it to your counselor for approval. Build a structural model. Construct a model showing corner construction of a wood frame building to a scale of 1 1/2"=1'0" (8:1 Metric). All structures shown must be to scale. Cardboard or flat sheet wood stock may be used for sheeting or flooring on the model. Review with your counselor the problems you encountered in gathering the materials and supporting the structure. Be able to name the parts of the floor and wall frames, such as intermediate girder, joist, bridging, subfloor, sill, sole plate, stud and rafter. Make a process model. Build a model showing the plumbing system in your house. Show hot and cold water supply, all waste returns, and venting to a scale of 3/4"=1'0" (15:1 Metric). Talk to your counselor about how to begin this model, and present the scale and the materials you will use. 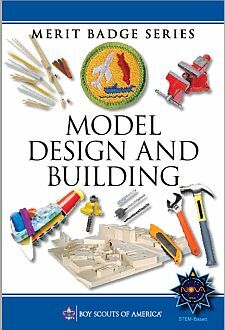 After completion, present the model to your counselor and be prepared to discuss any problems you had building this model. Make an industrial model. Build a model of an actual passenger-carrying vehicle to a scale of 1"=1'0" or ½" = 1'0" (10:1 or 25:1 Metric). Take the dimensions of the vehicle, and record the important dimensions. Draw the top, front, rear, and sides of the vehicle to scale. From your plans, build a model of the vehicle to scale. From your plans, build a model of the vehicle and finish in a craftsmanlike manner. Discuss with your counselor the most difficult part of completing the model.